REOs may be vacant or in need of repair, but often they look and feel just like other homes for sale, and they're listed by a real estate agent. Although they're typically sold as-is, it's not uncommon for an REO to be in move-in condition, but the process of buying an REO is different than other home purchases. 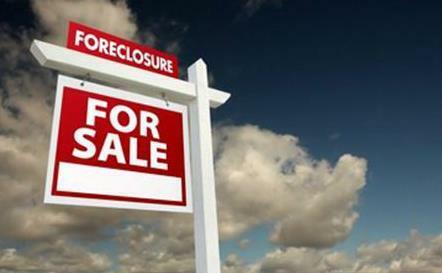 An REO property is one that has been foreclosed on and is now owned by the bank. Damaged: A damaged REO generally needs repairs and rehabilitation before you can move in. These types of REOs are attractive to investors and some buyers who aren't daunted by the work involved in rehabilitating a property. Often, you will get a bigger discount on damaged REO properties, but you have to consider refurbishing costs. Banks are eager to sell these properties and get them off their books. In most cases, they'll enlist an agent to clean up the property and list it for sale in the MLS, which means you'll find these properties listed alongside homes in the neighborhood that are being sold traditionally. If you're looking to buy an REO, it's important to work with an agent who has experience with foreclosures. Many times the bank will insist on an "as-is" sale and an experienced agent can help you work through your decision whether or not to move forward with the purchase based on the property's refurbishing needs. Often, you'll pay a below-market price for the property. 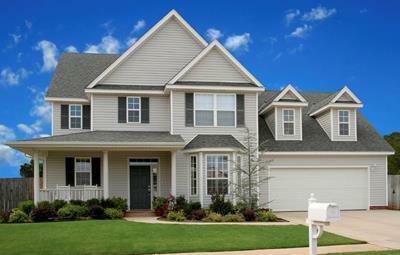 You'll be able to do inspections, purchase title insurance, and secure financing before completing the purchase. Many banks will require an "as-is" purchase and if there are problems or necessary repairs, paying for them is your responsibility. 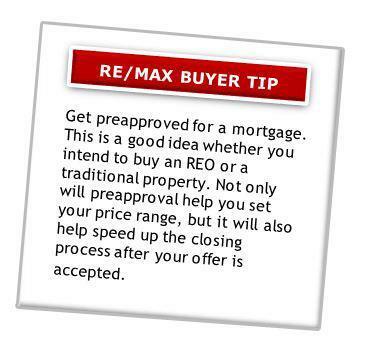 The REO process can take longer than a regular home sale. REOs vs. Short Sales: What's the Difference? The number of short sale transactions has increased in recent years and you're likely to run into homes like this on the market as you view properties. As with REOs, short sales can be complicated, so it's extremely important to find a real estate agent who is experienced and specifically trained. Working with a real estate agent who is educated and experienced in REO transactions is an important step toward a successful purchase. What kind of training or education have you had in REOs and foreclosures? How many REO properties have you successfully helped clients purchase? Were the REO properties you helped clients buy in the local area? In addition, the same tips apply here for choosing a real estate agent as those outlined in the Tips on Choosing and Working with a Realtor. Do not venture into REO territory alone. 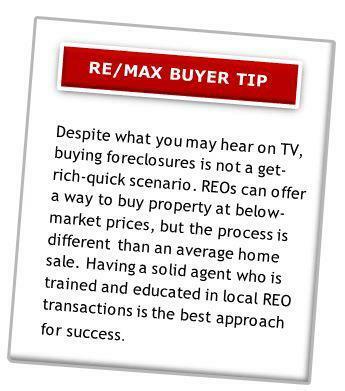 Many RE/MAX agents are thoroughly trained in REOs and have a solid reputation for success. Choose your agent wisely. Hiring an inexperienced agent: Work with a Realtor who is well versed in foreclosures in the area you're searching. Look for someone with advanced training and a great deal of experience in distressed properties. Not knowing the law: Foreclosure laws vary by state. What your neighbor’s cousin did in Florida won't necessarily play the same in California. Consult a Realtor familiar with your state’s laws who has facilitated REO purchases in your area in particular. Aiming too low: It's true that banks want foreclosures off their books, but that doesn't mean they'll accept a lowball offer. When making an offer, your agent should justify it with comparable data. An extremely low offer can derail negotiations. An experienced agent can coach you through the offer process. Considering price only: There's more to an REO property than price. Some properties have extreme damage and the cost of repairs could easily eat up any discount you're getting. Have the property inspected and see it for yourself. Objectively assess its value based on physical condition, location, and your ability to improve the property. Thinking short-term: Understand local market conditions – your agent can explain them in detail – before jumping in. Consider not just what’s happening now, but also where the market may be headed as you define your goals for your REO purchase. It's common to buy an REO to live in long-term or to keep as an investment property for rent.